Phenom Gallery continues to its fantastic line of officially licensed NBA screen prints with a super fun new design by acclaimed artist Dave Perillo, which pays tribute to the lovable mascots of the Association! 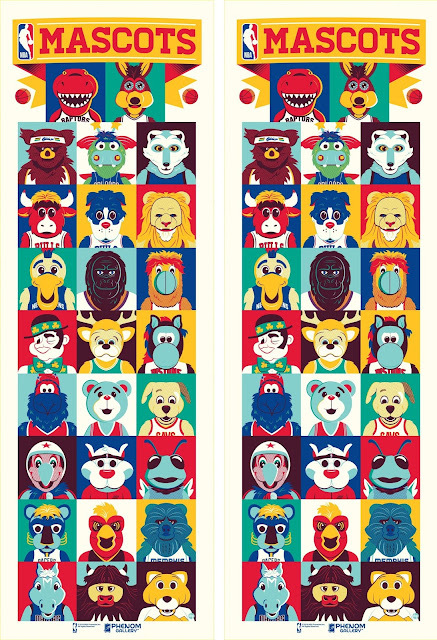 This poster amazingly includes every authentic current NBA mascot. It’s truly amazing how Perillo was able to use just 6 colors to capture this amazing assortment of colorful (and furry) personalities. “NBA Mascots” by Dave Perillo is a 12”x36” signed and numbered screen print. Limited to just 300 pieces, collectors can pre-order this new NBA poster exclusively at the Phenom Gallery online store for $60.